Treating the choice of the next Federal Reserve chair as an election campaign will bring citizens into the debate and raise vital issues. The big election race of 2013 is for the position of Federal Reserve chairman. The United States is not an economy democracy, however. So there will be no popular vote on who will make the most critical decisions on jobs, investments, interest rates and a host of other defining issues for working families, communities, states and the nation. But there is a campaign going on. In order to influence the selection of a new chair by President Obama and the Senate confirmation process: contenders are positioning. Camps and caucuses are organizing. Endorsements are being made. Issues are being placed on the table. So let’s invite the American people into the process. Let’s tell them how powerful the Fed is, and what it could do to address poverty, unemployment and the economic challenges faced by cities like Detroit. One member of Congress, Michigan Democrat Dan Kildee, is already inviting us to imagine the possibilities. Kildee’s point is well taken, not merely with regard to the debate over Detroit—but with regard to the debate over who will head the Fed. There are better choices, such as Janet Louise Yellen, who in her writings and in her tenure as the vice chairman of the Board of Governors of the Federal Reserve System has evidenced a higher commitment to the Fed’s mandate to promote high employment. She’s clearly a candidate—so much so that on Tuesday she got her first newspaper endorsement: from The New York Times. But Senator Bernie Sanders has suggested a pair of dark-horse contenders who—in a real race for the Fed chairmanship—would offer working Americans a genuine choice. 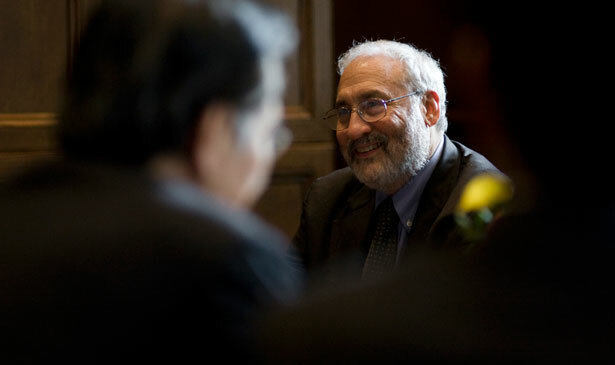 Declaring that “it’s time for new leadership at the Federal Reserve and a new approach to our troubled economy,” Sanders has identified Nobel Prize–winning economist Joseph Stiglitz and former US Labor Secretary Robert Reich as “excellent candidates” to replace Chairman Ben Bernanke when the chairman finishes his term January 31. But Sanders also recognizes that in the race for the Fed chairmanship progressives should have a contender. Or, perhaps, two. Those are not ideas that are now at the center of the discussion about who should head the Fed. This is the point of treating the race for the Fed chairmanship as an election, rather than an anointment. By putting Stiglitz and Reich in the running, Sanders invites organized labor and economic justice and urban policy groups to join the debate. By highlighting the progressive economic approaches advanced by Stiglitz and Reich, as an alternative to those advanced by Larry Summers, they expand the understanding of what the Fed can and should do—for Detroit, for cities across the country and for neglected rural communities. A quarter century ago, my colleague William Greider wrote the groundbreaking book: Secrets of the Temple: How the Federal Reserve Runs the Country (Simon & Schuster). The Fed still operates behind veils of secrecy. Most Americans do not know what it does and, more critically, what it can do. Treating the race for Fed head as a race, as a real campaign, invites citizens into the process. Urging the selection of Stiglitz or Reich might not lead to the actual choice of a progressive-populist as Fed chair. But it could turn the tide against Summers. It might help Yellen. And it would almost certainly create pressure on whoever takes charge of the Fed to recognize and embrace the full potential of the Federal Reserve. Does Larry Summers deserve a second chance?